Review by Trylon volunteer Caty Rent. 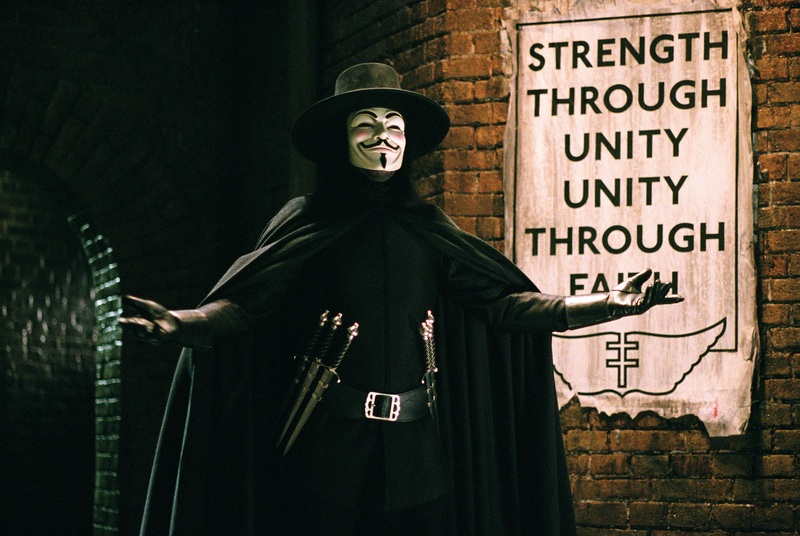 Originally written as a graphic novel in 1988 by Alan Moore and David Lloyd, V for Vendetta was translated for the screen in 2006 by the Wachowskis. Although the material differs and some of the characters change greatly, the film version still has a similar overall feeling of dystopian disillusionment and oppressive sociopolitical agendas. Moore wanted nothing to do with the film, believing the story should have remained one of Fascism v. Anarchy. He claims the Wachowskis altered it to depict American liberal values standing up to a state run by neoconservatives. That may be true. Even so, Lloyd was all for the theatrical version, stating, “The Guy Fawkes mask has now become a common brand and a convenient placard to use in protest against tyranny – and I’m happy with people using it, it seems quite unique, an icon of popular culture being used this way.” It is the top selling mask on Amazon.com with hundreds of thousands sold each year. Guy Fawkes gained his notoriety by being part of the botched Gunpowder Plot of 1605, an assassination attempt against King James I of England by a group of provincial English Catholics. The group hoped to blow up the House of the Lords during the State Opening of England’s Parliment. Fawkes was put in charge of the explosives because of his past military experience; he and seven others were convicted and sentenced to be hanged, drawn, and quartered. Since then, November fifth has been celebrated with fireworks. It is known as: Guy Fawkes Night, Bonfire Night, or Fireworks Night. There’s a rhyme that is spoken repeatedly throughout the film that commemorates this historical moment — Remember, remember, the fifth of November: the gunpowder treason and plot. I know of no reason why the gunpowder treason should ever be forgot. The film is set in the 2020’s in a post-apocalyptic and totalitarian England. There are strong ties to George Orwell’s novel 1984, such as the constant mass surveillance, large screens, the brutality of the police, strictly enforced curfews, and even the slogan of the party. In Orwell’s book, the party slogan is, “War is Peace. Freedom is Slavery. Ignorance is Strength,” whereas in V for Vendetta the slogan is, “Strength through Unity. Unity through Faith.” Citizens are persecuted and “black bagged” for believing, preaching, or even owning anything against the Norsefire Party or the High Chancellor. 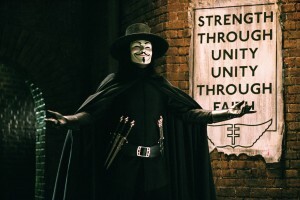 Standing against the regime is a masked vigilante known only as V, played by Hugo Weaving. His tactics are extreme, and we are left to decide for ourselves if he is a freedom fighter or a terrorist, a psycho or the only sane man left in the country. V blows up buildings, but he is eloquent and cultured, equal parts The Count of Monte Cristo and The Phantom of the Opera. Natalie Portman is Evey Hammond, the Christine Daae to V’s Phantom. Caty Rent is a confirmed ghost story and horror movie addict. V FOR VENDETTA screens Monday and Tuesday, April 20 and 21 at 7:00 and 9:30 at the Trylon. Tickets are $8.00, and you can purchase them here.